With super simple operation and ability to produce huge clouds of vapour, the Smok Stick V8 makes this bundle perfect for new and seasoned vapers alike. Including everything needed for a cloud-tastic vaping experience, this set comes with a choice of 3 super tasty E-Liquids, a USB plug for safe charging, and a K-Bag carry case for convenient storage. We’ve pre-selected juices that are appropriate for this device. If you’d rather customise your kit you can do so using the drop-down menus below. With it’s pen style design, the Smok V8 departs from the usual boxy style of high performance devices. It’s larger battery capacity means this is a chunky device which fits satisfyingly into the hand. The large fire button is easily clickable and flashes 4 times every time you vape. There really is very little to confuse on this device! Simply click the button, inhale and that’s it - there’s no complicated menu to set up! The device is also designed for easy fill and easy coil swapping. The tank is made from stainless steel and Pyrex glass, and comes with a wide bore Delrin tip. The wide tip is ideal for cloud chasing, but if you prefer something smaller you have the option of switching it for a different mouth-piece. 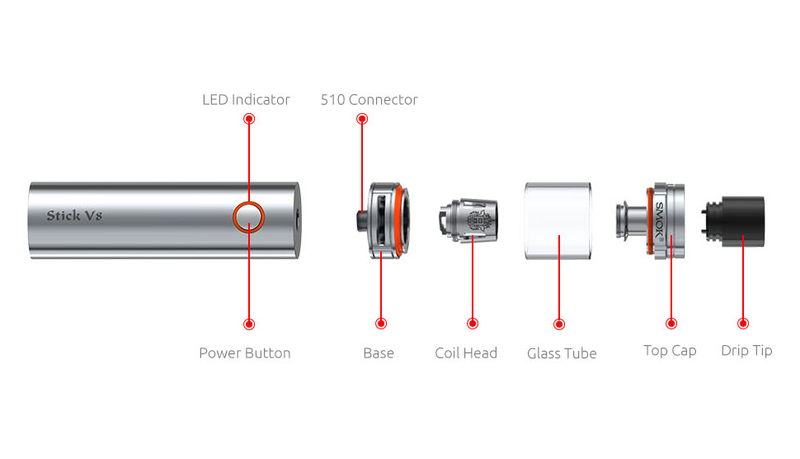 At the base of the Smok TVF8 tank is a double bottom airflow, with two large airflow holes. These give you a choice between a lighter airier vape or a warmer, tighter draw with more flavour. The Smok comes with a hinged lid to ensure top filling is quick and easy. Simply push the top to the side to access the side filling port. The Smok Stick V8 comes with two Smok Baby Coils, coming with a resistance of 0.4 ohms. These low resistances mean these are sub-ohm coils designed for blowing larger clouds of vapour. 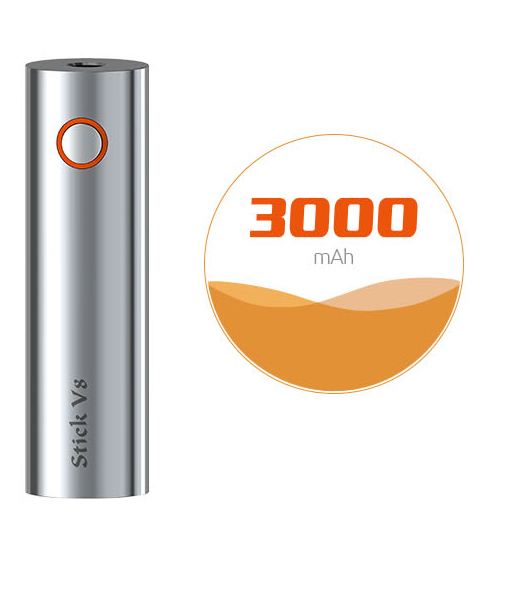 With 3000 mAh capacity, the battery is designed to last all day even while producing those large clouds. The battery comes with the usual built in safety protections, including automatic cut off, low resistance protection, short circuit protection and low voltage protection.